When I was in the Bangkok airport a month ago, I realized they have a newest body scan security machine put in place. The lady in front of me was so scared that she had to go into another queue that haven’t got this machine yet. She was trying her best to protect her privacy like everyone does. But in fact we have nowhere to hide. We are constantly being monitored and under the risk of being attacked in the digital world. Security experts predicted that mobile malware will escalate in 2013. As we digitalize more of our identity, we are at the same time putting our privacy at risk. 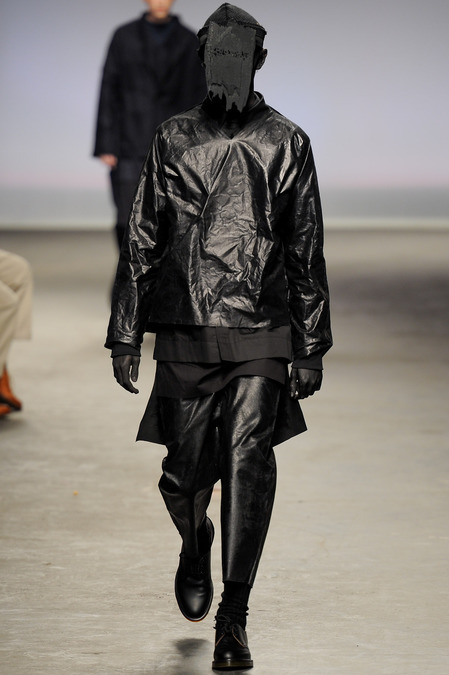 In the Menswear FW13 fashion runway, there are designers who are making the call for safety. 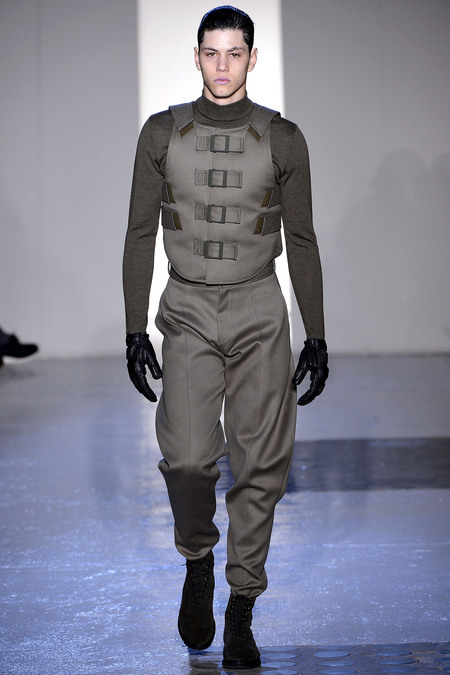 Mugler’s new collection joins the on-going military trend. Its men are air force that wear flight jacket and bulletproof vest. For Umit Benan’s graffiti artist inspired collection, all the models are covered in knit mask so that their identity won’t be revealed. Graffiti artists often live a double identity life and the mask becomes their window of freedom. 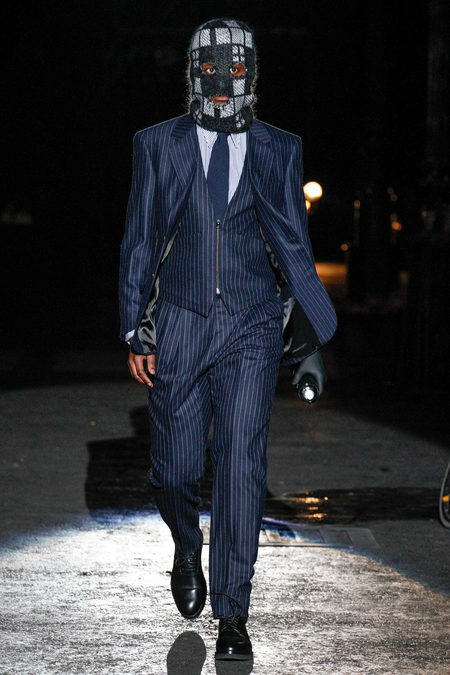 Models’ faces are also hidden in Craig Green’s collection, and to a more extreme extent. 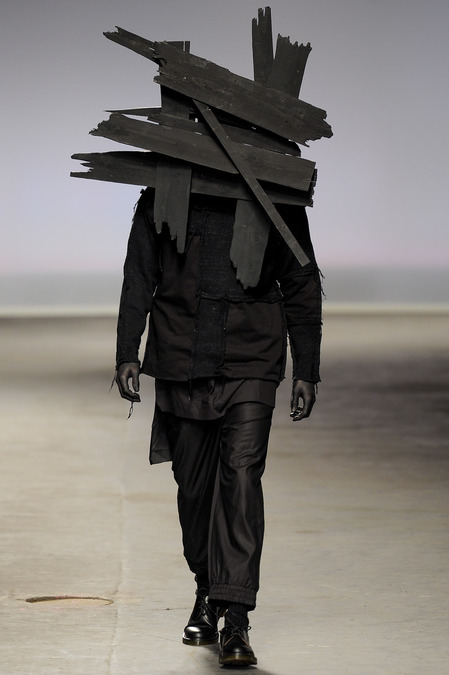 This young CSM graduate was inspired by shadow, so his models were painted black, or wearing black plywood headpieces. Fashion gives us the possibility to disguise ourselves, or transform into a different person. Can fashion be the protection against privacy invasion?